COPD is characterised by tissue destruction and inflammation. Given the lack of curative treatments and the progressive nature of the disease, new treatments for COPD are highly relevant. In vitro cell culture and animal studies have demonstrated that mesenchymal stromal cells (MSCs) have the capacity to modify immune responses and to enhance tissue repair. These properties of MSCs provided a rationale to investigate their potential for treatment of a variety of diseases, including COPD. Preclinical models support the hypothesis that MSCs may have clinical efficacy in COPD. However, although clinical trials have demonstrated the safety of MSC treatment, thus far they have not provided evidence for MSC efficacy in the treatment of COPD. In this review, we discuss the rationale for MSC-based cell therapy in COPD, the main findings from in vitro and in vivo preclinical COPD model studies, clinical trials in patients with COPD and directions for further research. On infusion, culture-expanded MSCs regulate inflammatory and immune responses and tissue repair. Following early observations that MSCs inhibit T-cell proliferation,9 MSCs were found to interact with the majority of innate and adaptive immune cells.10 MSCs can respond to local triggers, such as inflammatory cytokines and pathogen-associated and damage-associated molecular patterns. These triggers functionally mature MSCs towards either a pro-inflammatory or anti-inflammatory phenotype to regulate inflammation.11 12 MSCs furthermore contribute to tissue homeostasis through anti-apoptotic and regenerative properties.13 These various effects can be mediated via cell-to-cell interactions and secretion of soluble factors including growth factors, matrix proteins and cytokines, and through mitochondrial transfer and secretion of extracellular vesicles.14 15 Finally, transdifferentiation and engraftment of MSCs into local tissue have been described,16 17 but it is unclear to which extent this contributes to putative repair-enhancing activities of infused MSCs. 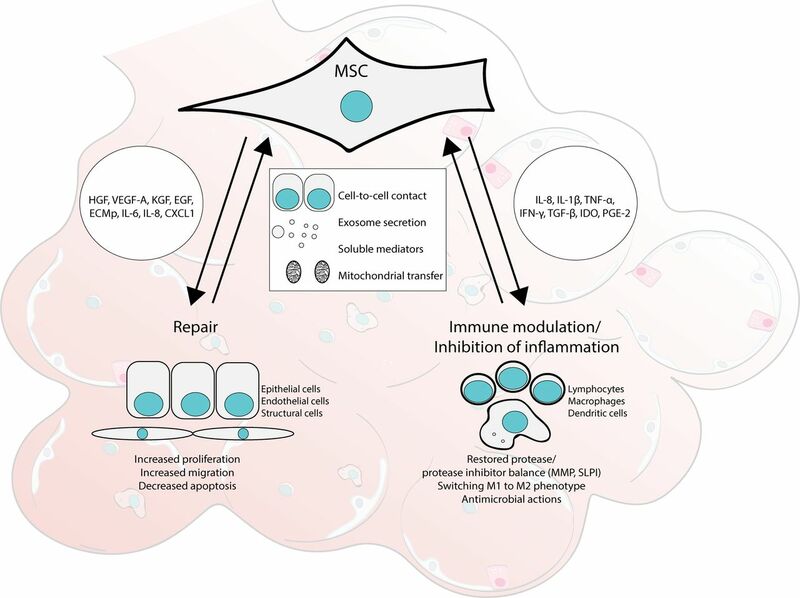 These largely preclinical observations suggest that MSCs exert a wide range of activities that may be beneficial clinically, but how they relate to MSC activity in humans is incompletely understood. The first clinical trials in the late 90s18 assessed safety of MSCs in non-haematopoietic diseases. The clinical potential of MSCs was put in the spotlight by a landmark case report by Le Blanc et al in 2004, indicating MSC efficacy on immune restoration in a paediatric patient with refractory graft-versus-host disease.19 This boosted the interest in MSC-based cell therapy for a variety of diseases characterised by dysregulated immune responses (inflammation) and/or by tissue damage (eg, ischaemic heart disease, spinal cord injury, osteogenesis imperfecta). In 2016, a phase III clinical trial reported positive results for the treatment of therapy-resistant complex perianal fistulas in Crohn’s disease.20 Thus far, clinical trials have indicated that MSC administration is safe and have shown promising results in immune-related disorders but mixed results regarding the clinical benefit in other diseases.21 22 The field is cautiously advancing towards placebo-controlled trials to further evaluate the efficacy of MSCs and research is ongoing to improve treatment efficacy and study the therapeutic potential of MSCs in other patient groups. Preclinical data indicate effectiveness of MSCs for treatment of a variety of respiratory diseases, including pulmonary hypertension, asthma, bronchiolitis obliterans, idiopathic pulmonary fibrosis (IPF), acute respiratory distress syndrome (ARDS) and bronchopulmonary dysplasia (BPD).23–25 Clinical trials in so far limited numbers of patients with IPF, ARDS or BPD have revealed that administration of MSCs (intravenous or intratracheal) is safe but have not yet demonstrated clinical benefit from MSC administration.26–28 Because COPD is characterised by inflammation, airway remodelling and destruction of lung architecture,29 the clinical potential of a cell population that can induce an anti-inflammatory, regenerative environment seems obvious. Indeed, supported by preclinical studies and based on promising results in immune diseases, MSCs have already been investigated in patients with COPD. Here, the data from these (pre)clinical studies using MSC-based cell therapy will be summarised, subdivided by data from in vitro, in vivo and clinical studies. Cell therapy studies using bone marrow cells that were not further cultured and/or selected before administration are not discussed in this review. This section will provide a non-exhaustive overview of in vitro studies focussing on effects of MSCs on inflammation and repair using lung epithelial or endothelial cell injury models. For a broader perspective on the anti-inflammatory, regenerative and paracrine effects of MSCs, we refer to the reviews by (Uccelli and de Rosbo,10 Murphy et al.11 and Liang et al.14). Anti-inflammatory effects of MSCs have been extensively studied in vitro.10 These include effects of MSCs on cells of the innate and adaptive immune system, and modulation of the balance between proteases and protease inhibitors. Immunomodulating effects of MSCs include inhibition of T-cell and B-cell proliferation, induction of regulatory B-cells and T-cells and skewing of monocyte/macrophage and dendritic cells to anti-inflammatory and tolerogenic phenotypes. These effects are exerted through direct cell-to-cell contact (eg, via programmed death-1 for MSC and T-cell interactions), changes in amino acid and lipid metabolism through indolamine 2,3-dioxygenase expression and COX2-mediated prostaglandin E2 (PGE2) production and secreted factors including transforming growth factor-β (TGF-β) and hepatocyte growth factor (HGF). Recent data suggest that phagocytosis of apoptotic MSCs by macrophages, and subsequent polarisation to an alternative macrophage phenotype contributes to their immunoregulatory effects.30 31 MSCs were also found to induce expression of secretory leucocyte protease inhibitor in elastase-treated lung epithelial cells via MSC-secreted epidermal growth factor (EGF) and HGF.32 This response is likely beneficial, especially in COPD, as protease inhibitors counteract protease-mediated tissue injury and degradation of protective mediators.33 In cocultures with cigarette smoke extract (CSE)-stimulated macrophages, MSCs increased the viability of macrophages and decreased their expression of the pro-inflammatory mediators cyclooxygenase 2 (COX2), interleukin (IL)-6 and inducible nitric oxide synthase, whereas secretion of the anti-inflammatory cytokine IL-10 was induced.34 Collectively, these properties of MSCs may be beneficial in COPD. In addition to their anti-inflammatory effects, antimicrobial effects are also ascribed to MSCs.35–37 These include direct inhibitory effects of MSCs on bacterial growth and indirect effects via secretion of immune-mediators that activate other (inflammatory) cells. Indeed, MSCs and MSC-derived conditioned medium directly reduce the growth rate and survival of several respiratory pathogens (Pseudomonas aeruginosa, Staphylococcus aureus and Streptococcus pneumoniae),38 which was in part attributed to the secretion of antimicrobial peptides.35 39–41 Indirect effects of MSCs on host defence may be mediated by secretion of immune-mediators such as IL-6, IL-8, granulocyte-macrophage colony-stimulating factor and macrophage migration inhibitory factor, which recruit neutrophils and enhance neutrophil antimicrobial activity.42 Both direct and indirect effects of MSCs may thus contribute to host defence responses towards invading pathogens, which may be relevant for preventing or treating COPD exacerbations as these significantly contribute to morbidity and mortality in patients with COPD. In vitro models of lung epithelial and endothelial injury have demonstrated that MSCs can prevent injury and restore damaged monolayers. These models included scratch wound assays and electroporation of monolayers to assess effects of MSCs on wound closure and barrier function, or the addition of stimuli relevant in COPD pathogenesis, such as CSE, elastase, papain or pro-inflammatory cytokines or bacterial products such as lipopolysaccharide (LPS). Using these models, MSCs as well as MSC-conditioned medium (MSC-CM) were shown to induce repair and to protect against airway epithelial cell damage. MSCs and MSC-CM enhanced wound closure in scratch wounds in the A549 alveolar epithelial cell line and in primary small airway epithelial cells, possibly by increasing migration and proliferation of epithelial cells.43 44 MSCs or unstimulated MSC-CM were also found to increase proliferation in lung epithelial cells injured by exposure to CSE or pro-inflammatory cytokines, suggesting a protective effect of MSCs.45 46 Similar results were obtained in NCI-H292 airway epithelial cells47 and in (human umbilical vein) endothelial cells,48–50 including observations that adipose-tissue-derived stromal cell (AT-MSC) conditioned medium restored endothelial barrier function following CSE exposure.49 Furthermore, MSCs reduced apoptosis in pulmonary cell cultures derived from papain-treated mice and in CSE-stimulated endothelial cells.50 51 The potential mechanisms that underlie these effects are partially attributed to MSC-secreted factors: secretion of IL-6, IL-8 and chemokine (C-X-C motif) ligand 1 by MSCs was found to enhance A549 alveolar epithelial cell migration,44 keratinocyte growth factor (KGF) secretion-induced epithelial cell proliferation46 and reduction of the number of apoptotic cells was linked to vascular endothelial growth factor (VEGF)-A50 51 and HGF.52 It was furthermore suggested that MSCs support epithelial cell attachment and spreading via secretion of extracellular matrix proteins.43 53 Finally, the observation that mitochondrial transfer from MSCs to airway epithelial cells may protect against cigarette smoke-induced injury is of special interest in view of the increasing number of reports on mitochondrial dysfunction in COPD.54 This non-exhaustive list of factors constitutes only a small fraction of the factors secreted by MSCs55 and future investigations are expected to further elucidate factors involved in MSC-mediated wound repair in vitro. In summary, in vitro studies show that MSCs exert a range of anti-inflammatory and immunomodulatory effects relevant to COPD, including improved protease/protease inhibitor balances, interactions with macrophages and antimicrobial effects. In addition, MSCs enhance wound healing in lung epithelial and endothelial cell models in vitro by increasing proliferation and migration and reducing apoptosis. The observation that MSC-CM exerts similar effects as MSCs supports the paracrine actions of MSCs, but many of the active factors still need to be elucidated. Furthermore, future investigations should focus on preconditioning of MSCs to enhance their regenerative and migratory potential. The initial observation by Shigemura et al60 showing that MSC-based cell therapy improves lung architecture, decreases apoptosis and increases cell proliferation was confirmed by several subsequent in vivo studies,45 50 54 61 65-67 and a meta-analysis.68 The exact mechanisms responsible for this repair have not yet been fully elucidated. The large body of circumstantial evidence is summarised in this section on in vivo COPD models, with a particular focus on effects of MSCs on inflammation and repair (see figure 1 for a schematic overview and table 1 for details on study protocols). Mechanisms underlying the modulation of inflammation and lung tissue repair by MSCs in COPD. MSCs potentially act through cell-to-cell contact, mitochondrial transfer and secretion of soluble factors (either directly secreted or in exosomes), including growth factors, (anti)-inflammatory cytokines and chemokines (as indicated), thereby improving tissue homeostasis by favouring repair and dampening inflammatory responses. AMPs, antimicrobial peptides; CXCL1, chemokine (C-X-X motif) ligand 1; IDO, indolamine 2,3-dioxygenase; EGF, epidermal growth factor; ECMp, extracellular matrix proteins; GM-CSF, granulocyte macrophage colony-stimulating factor; HGF, hepatocyte growth factor; IFN-β, interferon-β; IL, interleukin; KGF, keratinocyte growth factor; MIF, migration inhibitory factor; MMP, matrix metalloproteinase; PGE2, prostaglandin E2; SLPI, secretory leucocyte protease inhibitor; TGF-β, transforming growth factor-β; TNF-α, tumour necrosis factor-α; VEGF-A, vascular endothelial growth factor-A. COPD is characterised by an enhanced inflammatory response,29 and assessment of MSC-mediated effects on inflammation is therefore relevant. Assessment of the effect of MSC treatment on inflammation in in vivo studies mostly included immunohistochemical evaluation of pulmonary inflammatory infiltrates, bronchoalveolar lavage fluid (BALF) analysis of inflammatory cells and cytokines and analysis of mRNA expression of inflammatory cytokines in lung tissue. MSC treatment reduced inflammatory cell infiltrates in peribronchiolar, perivascular and alveolar septa in lung tissue compared with control,34 50 61 69 and a relative increase in alternatively activated (or M2) macrophages was observed.34 61 This increased abundance of macrophages with an anti-inflammatory phenotype may contribute to reducing inflammation and enhancing repair responses.70 One study showed no decrease in inflammatory parameters on MSC administration in an emphysema model of chronic LPS exposure.71 In BALF, the total number of inflammatory cells and its subsets, that is, macrophages, neutrophils and lymphocytes, were lower in MSC-treated animals,63 66 69 whereas there was a relative increase in type 2 macrophages.34 BALF analysis of inflammatory cytokines involved in COPD pathogenesis showed a significant reduction of IL-1β, TNF-α and KC (murine IL-8 homologue) concentrations following MSC treatment,32 63 although other studies did not observe such effects.71 72 In line with decreased BALF-cytokine concentration, decreased mRNA expression of these cytokines were observed in emphysematous lung tissue following MSC treatment,32 50 52 61 69 but results for monocyte chemoattractant protein 1 were conflicting.50 69 Besides, treatment with MSCs decreased concentrations of several matrix metalloproteinases (MMPs), that is, MMP2, MMP9 and MMP12.50 Although MMPs are important regulators of extracellular matrix homeostasis, abundance of MMPs has been linked to tissue destruction in emphysema73 suggesting that decreased levels may contribute to tissue homeostasis. In conclusion, administration of MSCs appears to dampen inflammation in animal models of emphysema, reflected by a decrease in cytokine concentrations, inflammatory cells and infiltrates in lung tissue. There appears to be a role of MSC-mediated changes in macrophage polarisation towards alternatively activated type 2 macrophages, likely contributing to dampening of inflammation, but effects of MSCs on other immune cells were not systematically investigated. Furthermore, the precise mechanisms of action of MSCs in vivo are yet to be investigated. Tissue destruction in emphysema is characterised by a loss of alveolar attachments, and MSC treatment was found to restore damaged alveolar structures in animal models of emphysema, reflected by a decrease in the mean linear intercept (a measure that describes the mean free distance in air spaces),32 34 45 49–52 54 61 65–67 74 although this was not shown in chronic LPS-induced tissue destruction.71 In some of these studies, MSCs were administered during induction of emphysema, suggesting that inhibition of emphysema development may have contributed to the effects (table 1). The observed restoration of damaged alveolar tissue is likely related to a decrease in numbers of apoptotic cells, usually assessed using TUNEL assays or by measuring caspase-3 concentrations45 49 50 52 60 61 65-67 and to increased numbers of proliferating cells, that is, Ki67+ or PCNA+ cells.45 60 66 Besides, an MSC-induced reduction in collagen deposition was observed in elastase-induced emphysema, suggesting antifibrotic effects that may contribute to inhibition of airway remodelling in COPD.52 Factors that contribute to MSC-mediated tissue repair are described in the following section. Collectively, these studies show that administration of MSCs restores lung architecture, decreases apoptosis and increases cell proliferation in animal models of emphysema. Several indicators of inflammatory responses are affected by MSCs, apparently in favour of dampening inflammation. Indirect evidence suggests that a regenerative environment is created via paracrine effects of MSCs and MSC-induced secretion of growth factors by local cells, resulting in higher concentrations of soluble factors that are relevant for tissue repair and that prevent apoptosis of endothelial cells. MSC engraftment and differentiation on the other hand are not considered to deliver a relevant contribution to tissue repair (figure 1). However, it should be taken into account that these studies were designed to detect maximum effects of MSCs, predominantly used ‘acute’ models of emphysema and were variable regarding cell numbers, route and timing of MSCs administered. These issues require further investigation, particularly in light of the fact that the clinical relevance of these preclinical results still needs to be established, as will be discussed in the ’Clinical trials' section. Finally, a clinical trial designed to assess MSC effects on local inflammation resulting from endobronchial valve (EBV) placement for severe-to-very severe COPD (GOLD III-IV) demonstrated the safety of endobronchial instillation of allogeneic BM-MSCs (100×106 cells) prior to EBV placement, compared with saline-treated controls (five patients per group). In the MSC treatment group, serum CRP concentrations significantly improved up to 90 days follow-up.83 However, given the study design, this study cannot be viewed as one focused on MSC therapy for COPD. It is evident that despite the encouraging preclinical data, a cure for COPD based on administration of MSCs is not yet at hand. It will take time and effort to elucidate the precise mode of action of MSCs. This may result in identification of biomarkers in patients with COPD that can serve as an early indicator that the progressive course of COPD is amended, which is essential to optimise treatment protocols. To reduce costs and limit the number of patients required to answer the unresolved questions, there is an urgent need for preclinical models that accurately reflect the human pathophysiology, for example, ex vivo lung perfusion, organoids, microfluidic lung-on-a-chip and lung tissue slices. Preclinical studies suggest that cell therapy using MSCs is a potential new treatment strategy for COPD. Both in vitro and in vivo studies have demonstrated the regenerative potential of MSCs, which is reflected by their ability to induce airway epithelial and endothelial repair, and restore lung tissue architecture in emphysematous lungs in animal models. These effects relate to increased proliferation and migration of target cells and reduction of apoptosis. Besides, MSCs modulate immune responses, dampen inflammatory responses in preclinical COPD models and affect protease/protease inhibitor balances favouring tissue homeostasis. The precise mechanisms are not fully unravelled, although the involvement of a number of secreted factors including cytokines and growth factors has been suggested. Whereas initial studies in a limited number of patients with COPD have revealed that MSC treatment is safe, so far there is no evidence for clinically relevant effects and further studies are needed to demonstrate that MSC-based treatments are of clinical relevance to patients with COPD. Important challenges need to be addressed, including optimising the MSC treatment regimens and identification of responsive outcome parameters, for example, in lung tissue. Such information may guide us in the choice of clinical outcome parameters for MSC treatment in patients with COPD. The lack of effective interventions to restore lung function in COPD will be an important driver for these and other innovative approaches to the treatment of this highly prevalent disease.
. Stromal cells responsible for transferring the microenvironment of the hemopoietic tissues. Cloning in vitro and retransplantation in vivo. Transplantation 1974;17:331–40.
. Pathogenesis of COPD. Part I. The role of protease-antiprotease imbalance in emphysema. Int J Tuberc Lung Dis 2008;12:361–7. Contributors All authors contributed in writing of the manuscript and/or have provided useful comments and additional text to improve the manuscript. Design and concept: WB, JS, PSH. Drafting of the manuscript: WB, PPSJ, PSH. Critical revision of the manuscript for important intellectual content: all authors.